The fastest Land Rover vehicle ever. The 5.0-liter Supercharged V8 gas 575 HP engine delivers a powerful 516 lb-ft of torque taking it from 0-60 mph in 4.3 seconds.4 Performance is underlined by the integrated air vents in the Carbon Fiber hood and the large intakes in the bumper to maximize airflow to key components when utilizing the vehicle’s full potential. 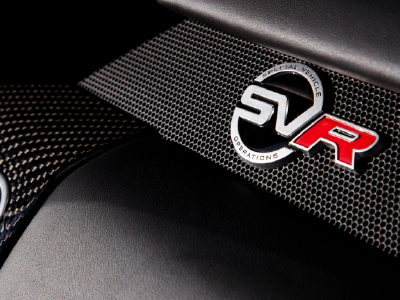 SVR performance seats are complemented by an exclusive steering wheel design and finishes in Satin Brushed Aluminum, Grand Black or Gloss Carbon Fiber. SVR branding in key locations serves to remind occupants that they are in our fastest and most capable performance SUV ever. 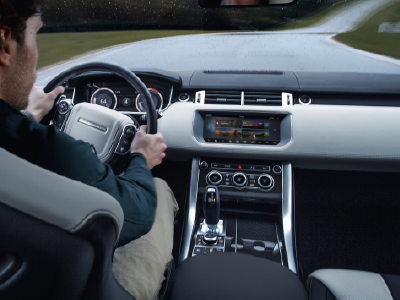 The SVR exterior is accentuated with a unique hood design in carbon fiber composite, which can be specified in the vehicle’s body color or in the striking exposed Gloss Black Carbon Fiber. The muscular stance of the SVR is complemented further by a mesh grille with SVR badging and side fender vents in Narvik Black. The look is completed with Premium LED headlights and signature Daytime Running Lights. 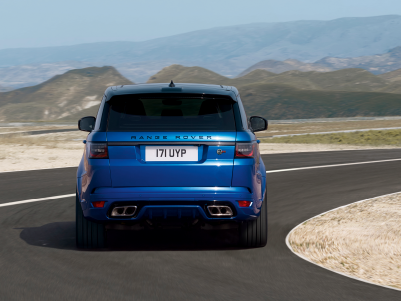 The SVR features 21″ 5 split-spoke ‘Style 5091’ alloy wheels with Satin Polish finish as standard. The optional 22″ 5 split-spoke ‘Style 5083’ with either a Gloss Black or Satin Polish finish can also be specified.